Published a couple of weeks earlier, IEMA’s 2018 survey of its members – environment and sustainability professionals – found that there is a 14.1% gender pay gap, which is 2.6% less than it was in the previous survey but still higher than the national average. Women are also under-represented in senior roles (the survey found 77% of ‘leadership’ roles are held by men), and in senior membership grades. As a Fellow of IEMA, I am in a tiny minority: 84% of the Fellows who responded to the survey are male. When we were approaching speakers for She is Still Sustainable, we were challenged to think more widely than gender. What about women of colour? What about lesbian and bisexual women? We broadened our panel to include people who could speak from personal experience and give us some analysis: Lisa Pinney MBE is an Area Director with the Environment Agency, an LGBT+ ambassador and until recently was a trustee of LGBT+ rights organisation Stonewall. Angela Francis is Chief Economist at the Green Alliance and shared her experience of growing up as 'the only mixed-race girl in the village' (apart from her sister). As was ruefully pointed out, while it was wonderful to have so many mid-career women in the room, we were an overwhelmingly white crowd. I can’t speak confidently about our diversity along dimensions of sexuality and class, but my guess is that that we were not a very diverse group. We have more work to do to make these events inclusive of all women working in sustainability. Early on we asked people to stand up if they had caring responsibilities, and then if they didn’t have caring responsibilities. It was roughly 50/50 split, which was a surprise to me: as someone who checks up on the health and happiness of my children and my parents, it was a useful reminder that not everyone's circumstances are like mine! The Environment Agency has an active LGBT+ network, and its recent gender pay gap report shows a really interesting level of attention being paid to understanding how not being male, white, straight and able-bodied impacts on pay and progression. The Environment Agency also looked at the differences between people who self-identify as religious or not. 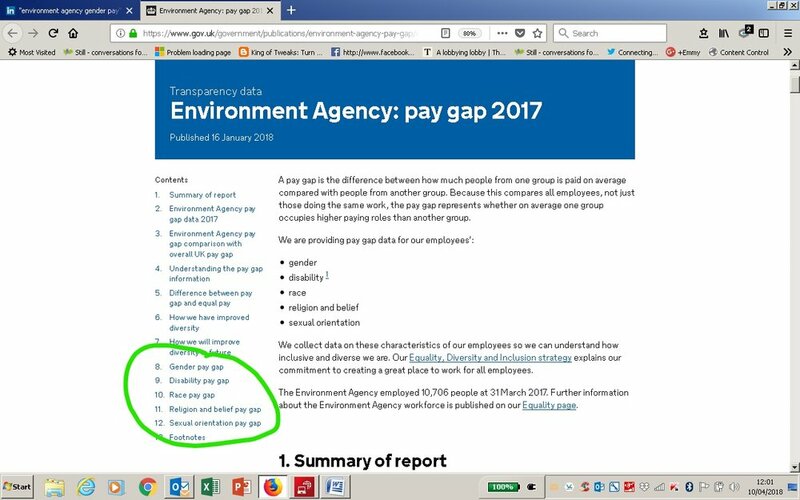 TL:DR – the Environment Agency’s headline gender pay gap is around 2.5%, very similar to its disability pay gap of 2.6%. Its race pay gap is higher at 3.3%. Its ‘religion and belief’ pay gap is -0.2% - those employees who have a declared religion earn marginally more than their colleagues with no declared religion or belief. Unhappily, the pay gap for LGB employees is 6.2%. All these figures are the ‘ordinary hourly pay gap’. The report contains information on bonus payments and representation at different levels of the organisation. What is exciting about this report, for me, is that it exists at all at this level of detail. I assume that the leadership is paying attention. That as a profession, we have absolutely no room for complacency – and lots of room for improvement, regret and shame. 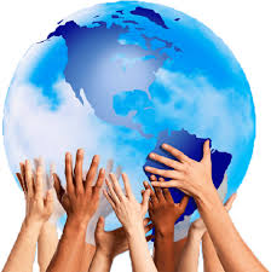 We can and should be paying more attention to the diversity of our own profession and movement – for our colleagues, for the people we are working with to solve sustainability problems, and as part of our contribution to meeting Sustainable Development Goal 5 (gender equality) and 10 (reduced inequalities within and between countries). Older PostWho gives us permission?